From acclaimed author Gretchen McNeil comes her first realistic contemporary romance—perfect for fans of Kody Keplinger’s The Duff and Morgan Matson’s Since You've Been Gone. I started reading this one about 3 times. I would read the first couple of pages, then wind up putting it down and starting another book. I am not sure what changed between the 3rd and the 4th try, but the 4th time was the charm. I started and I could not put it down. Bea is known as Math Girl in her school. Her two best friends, Spencer and Gabe, don't fare much better. Spencer is the invisible artsy guy and Gabe, the loud-mouth, sarcastic writer who doesn't think before he speaks. They are starting their final year of high school, and the first day things are already taking a bad turn. Gabe almost gets beat up because of an article in the paper, and there is a new girl in school who is threatening Bea's first relationship with Jack. So Bea decides to use her awesome math skills to come up with The Formula. This Formula will put Spencer and Gabe in the path of popularity, and give them the best senior year possible. She puts her Formula to work on the boys, and it goes perfectly. Bea is happy for the boys. But when Jack dumps her for new girl, Bea decides to create a new Formula to get him back. She is reinvented as Trixie, every one's favorite Manic-Pixie-Dream-Girl. It looks like her Formula is working like a charm, but at what cost? And is Jack really who she wants? Or does she want someone who loves her as Math Girl? The one word that comes to mind whenever I think of this book is CUTE. It is too cute. But there are other themes in the story that truly matter. It isn't just a cute book to make you smile and laugh. It is a book to make you think about the YOU that you really want to be. It also makes you think about and question what really matters in life. I won't say this is a profound book, but I think it is important, in it's own right. And the fact that Gretchen McNeil can make you laugh while she is making you think is a huge point in her favor! I adore the relationship between Bea, Spencer and Gabe, and I think you will too! If you like a light and fun contemporary, with a sweet little romance in story, then I would absolutely recommend this one to you! 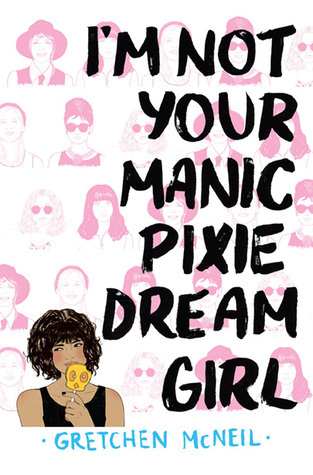 Also, it's nice to finally understand what the heck everyone was talking about when they kept saying "Manic-Pixie-Dream-Girl"!